Plumbdog Plumbing & Gas Pty Ltd was founded early July 2010 by pack leader, Richard Palmer, after he realised that the Perth plumbing industry was a bit ruff! Richard identified a need for reliable plumbers with great knowledge and customer service. At the time, most tradies had a reputation for not turning up to jobs at the agreed time and place while charging extortionate prices. Apprentices or tradesmen had been rushed through their apprenticeships during the housing boom, which meant that they were expecting unrealistic wages and were grossly under-educated about the industry and their trade! With Indie by his side (back then a mere cute puppy), Richard pounded the streets delivering flyers to local residents. As Indie was a major part of growing the business, it was decided that the company would be called ‘Plumbdog’. She also became the main focus behind the company logo (her name is on the dog tag, and bears Richard’s licence number on her overalls). 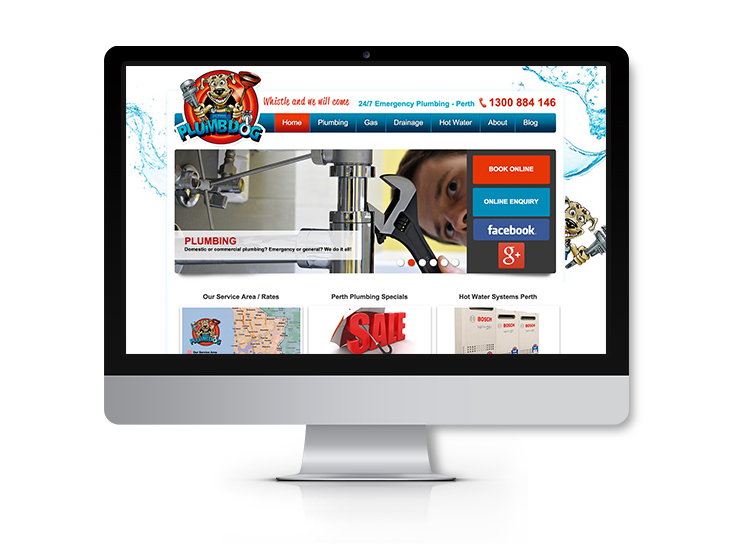 RESULTS: With over 80 keywords ranking #1, Plumbdog Plumbing & Gas enjoy a monopoly over the search results in Perth for this competitive industry, thanks to years of working with geoLocalSEO. Lisa and her team at geoLocalSEO are absolutely fantastic and I couldn’t ask more from them in the services they provide. Whether you meet Lisa in person or simply by phone you are instantly put at ease by her soft nature and her honesty and this is a great way to pave a business relationship in my opinion, to the point that I have been using Lisa’s services for a number of years now yet have only recently met her face to face recently during a business trip to Queensland. In my capacity as Managing Director of Plumbdog Plumbing & Gas Pty Ltd, Perth’s only ‘genuine’ 24/7 plumber and gas-fitters it is important that I keep up to date and ahead of the competition in this digital society we find ourselves in and Lisa and her team are leaps and bounds ahead of their competition in exploring new ways of keeping Google and other search engines as best mates with your website. geoLocalSEO are now a one stop shop for us at Plumbdog and look after our Web Development/Organic SEO including link building & content writing, Google/Bing Adwords, Google +/Monthly newsletters, and soon to be re-engaging our Facebook advertising. For me it is important to work with a well-functioning team and Lisa manages all of this for us.